Waterfront folksinger Mark Lovewell guest performed at the Minnesingers’ 2017 season show, awing the crowd with his guitar and harmonica rendition of holiday favorites. 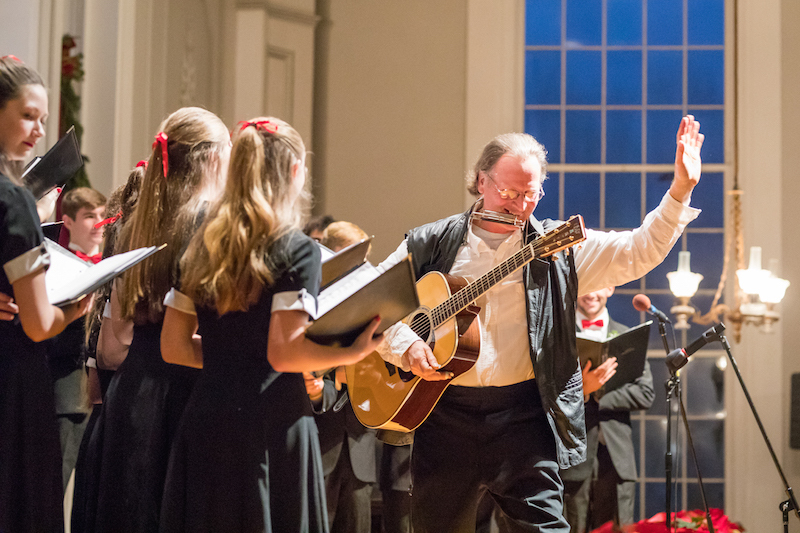 The Minnesingers audience at the Old Whaling Church in Edgartown was packed for the Friday and Saturday showcases to revel in Lovewell and other guest performers firsthand. Before his performance even began, Lovewell stopped the show to praise the Minnesingers’ hard work as the elite choral group at their regional high school. “You inspire us. You make us a better community,” he said. After an explosion of applause from the audience, Lovewell entertained the crowd with his rendition of Silent Night alongside the choir. His music—a 21st-century revival of folk music’s 20th-century prime—was one of the night’s standout performances. Read more about the Minnesinger’s season show here.